The Village Planning Board met on Wednesday, February 27 at 7:30pm. Board members Sherry Bishko and Michele Merson were absent. The applicant and the Planning Board reviewed the revised preliminary FEIS for the project. The timing of infrastructure improvements. Ultimately, it was determined that the review would continue at the next meeting of the Planning Board, which is scheduled for March 11. The Village Planning Board met on Monday, April 24 at 7:30pm . All members were present. The Board discussed the McQuilkin/Russell application, which seeks a lot line change, which would effectively combine three smaller lots into one large one. 72 Circuit road contains a habitable structure, which the applicant would like to turn into a guest house. The public hearing was continued from the previous meeting, however since no members of the public were present, the Board focused on the Environmental Review. Board member Peter Regna expressed his concern over the lack of documentation permitting the applicant to maintain two habitable structures on one property. As per the review form, he wondered if either a Special or Conditional Use Permit was required and if so, where that documentation was. He is also concerned with the legal habitability of the proposed guest house and he cited the official Powers and Duties of the Planning Board in terms of site plan approval as follows: “a habitable building shall mean a building that has a Certificate of Occupancy or has had a certificate of occupancy within the last five years.” He stressed that while he would very much like for the applicant to move forward with their plan as proposed, he felt it was extremely important that they do so legally and in compliance of the code, especially considering the Applicant’s position on the Planning Board. He suggested that they should be able to back everything up with documentation and that if necessary, the BZA should be asked to grant variances in order to bring the project into compliance. This was discussed at length as was the history behind the project and the various parcels to be combined. The proposed guest house will not have an independent Certificate of Occupancy and the applicant has agreed to sign a covenant stating that they will never seek one for that structure. The idea of precedent was touched upon as were some of specific similarities and differences between this application and others that the Planning Board has recently approved. The Public hearing was officially closed. Following a lengthy discussion, the applicant was referred to the BZA. 1. Application of Robert McQuilkin & William Russell, 82 Circuit Rd., Maureen Love, 72 Circuit Rd. and William Nixon, 62 Circuit Rd, to change the lot lines affecting three parcels, resulting in a change of lot sizes of such parcels. The application and plans are available for review Monday through Friday from 9:00 a.m. to 3:30 p.m. at the Village Hall, Village of Tuxedo Park, 80 Lorillard Road, Tuxedo Park, NY. All neighbors and/or parties interested will be heard. The Village Planning Board met on November 7, 2016 at 7pm. All members were present. Board Chair JoAnne Hanson opened the meeting by asking attorney Brian Nugent to speak to some of the points that were raised during the first part of the public hearing in order to provide some context that might be useful moving forward. Mr. Nugent explained that with regard to the issue of precedent, the Planning Board was not typically a precedent setting body. Rather, setting precedent falls more on the shoulders of the Board of Zoning Appeals, as it is their job to interpret the Village Code or the Building Inspector’s view thereof, and render a decision based on that interpretation. The Planning Board receives applications that are based on facts, which are unique to those specific applications. It is their job to review the applications and address any planning related concerns prior to approval. The odds of the Planning Board receiving the same application twice are unlikely and therefore, the approvals are not really precedent setting. In this case, the application has already been granted variances by the Board of Zoning Appeals. In order for the Planning Board’s decision to be precedent setting, there would have to be another application, which had received the exact same variances from the BZA before them. Again, Mr. Nugent suggested that while there could possibly be similar circumstances down the road, the likelihood of two identical applications was not strong. He further cautioned that the Planning Board was not in a position to overrule the BZA and when rendering their decision, they should not be analyzing those issues/factors that have already been looked at by that Board Chair Hanson asked for some clarification, commenting that the BZA variances had granted subject to Planning Board approval. Mr. Nugent explained that they were really two separate decisions. Should the Planning Board decide not to approve the subdivision, the variances will die. Board member Peter Regna expressed some confusion with regard to the role of the Planning Board vs. The Board of Zoning Appeals. He read aloud the BZA’s approval, commenting that it seemed to him, based on the advice the Planning Board had received from their attorney, as though the BZA was really doing the mechanical work (site plan, the variances, distances, acreage, etc.) and that the Planning Board should be looking at the wide range of potential effects this decision might have moving forward. Mr. Nugent has described the process as a fairly rigid one, while the other attorney has suggested that there should be some emotion involved in looking to the future and focusing less on issues such as lot lines and sight distance etc. Mr. Regna wondered which viewpoint was correct. Mr. Nugent responded that there was not much difference between the two legal viewpoints. The BZA decision leaves room for the Planning Board to review the proposed subdivision from a planning prospective. If they should collectively decide that they do not feel it is a proper subdivision and they do not like the lot arrangement, they can reject the application and the variances will die. He further suggested that he was not sure that a planning review should include in depth consideration of the future. They are looking at the application today. Mr. Regna responded that they were trying to protect what consequences there may be of whatever action they take. Mr. Nugent agreed, stating that they would be incorporating today’s planning for the Village in terms of how it exists as well as looking towards the future. Part of looking towards comes in terms of code revisions and Village Board actions. As far as what is before them currently though, he is not suggesting that they are mandated to approve it, but he cautioned that it would be improper for them to reject it on the basis of setback, for example, because the BZA has already analyzed that issue and made a determination. The Public Hearing was then resumed. Mr. Zgonena stated that following the last meeting he had drafted a letter specifically requesting Mr. Regna’s recusal from this matter. As this has not occurred, and Mr. Regna was both present and participating in the discussion, Mr. Zgonena further stated that he would like to go formally on the record with his request. He then read aloud the letter he had previously written and sent to Planning Board Chair Joanne Hanson requesting the same. In summation, he believes Mr. Regna should recuse himself because he was identified as a plaintiff’s witness in a 14th Amendment Lawsuit Mr. Zgonena filed against the Village, various Village agencies and several individuals in November of 2014. Mr. Zgonena feels that Mr. Regna’s involvement with various Village agencies as well as approvals he has received on his own properties, make Mr. Regna a person of interest in his case and he does not expect his participation to be friendly. He does not feel that Mr. Regna is capable of differentiating personal problems that he has with him from his decision making on the Planning Board. Mr. Regna requested permission to respond, but Chair Hanson stated that she would prefer he not. She further commented that the Planning Board would go through and review individual conflicts of interest prior to voting and that this request would also be reviewed at that time. Jake Lindsay commented that as a member of the ZBA, he had been part of the decision making process and that he had been negative in his decision. The reason for this was that it was clear to him that the lot, which is being split off from the main lot, is totally substandard. It requires 8 variances and is barely more than a garage with an apartment on top of it. He was very concerned with the precedent that the BZA might be setting in granting the variances and he hopes that the Planning Board will look upon it from a planning prospective and realize that it does not work. Mary Graetzer commented that she had been alarmed to learn that there would be 15 variances involved with the subdivision. She wondered why they would want to grant a subdivision to property that would require so many variances. It seems to her as through there is too much wrong with the whole thing, and she does not feel it would be good planning to approve it. Thank you for this opportunity to comment on Mr. Zgonena’s application to subdivide his Ridge Road property. I have read all available minutes and listened to the recordings of the meetings, including the Zoning Board meeting of May 26th. In addition, I went to the Village Office and read the file. Mr. Zgonena is applying for a sub-division of his Ridge Road property under 85-4. On the face of it, it looks like this is a simple, albeit, important, matter. In the record PB and Zoning Board members refer to the pre-existing use of the property. However, the record shows no review of the history of this property or definition of this term. There appears to be no examination of the Zoning Code for guidance in determining the path Mr. Zgonena, the owner of a nonconforming property, needs to follow to achieve his goals for the property. I think a lot of assumptions were made about what preexisting use means, and perhaps falsely an assumption that Mr. Zgonena has the right to apply directly for a subdivision. Where did that come from? To back up a bit, at least two buildings existed as accessory structures on this parcel that was subdivided long before our zoning code was established. At some point, prior to 1990, Betsy Draper purchased the property. The laundry building, with additions made, became her residence. Later, Betsy obtained a C of O for an apartment created in the garage located on the parcel that she rented to the Park School. During the time Betsy owned the property, the Zoning Code changed. Under the new 4 acre zoning, the lot size was deemed substandard and the buildings were considered to be noncomplying and to have nonconforming uses. Article V of the Zoning Code was created to ensure that certain rights of owners of such lots and buildings would be protected. Article V of the Zoning Code addresses non-complying uses and structures and the limits of their protection. Those rights, with their limitations, were passed on to Mr. Zgonena when he bought the property sometime in 2005.
because Mr. Zgonena wants to change the use of this property and increase the noncompliance of the use, the buildings and lot. At the very least, he appears to be changing a non-conforming use to another nonconforming use. No nonconforming use shall be enlarged, altered, extended or restored or placed on a different portion of the lot or parcel of land occupied by such use on the effective date of this chapter (or on the effective date of any amendment thereto affecting such use), nor shall any external evidence of such use be increased by any means whatsoever. No nonconforming use shall be moved to another location on a separate lot or parcel where such use would be nonconforming. No nonconforming use shall be changed to another nonconforming use without approval by the Board of Zoning Appeals, and then only by grant of a use variance upon satisfactory proof of eligibility for same. A nonconforming use may be changed to any conforming use and the applicable district bulk regulations and off-street parking requirements shall not apply to such change of use or to alterations made in order to accommodate such conforming use, provided that such alterations do not create any new or additional nonconformity in regard to such regulations or requirements nor increase the degree of any such noncompliance with bulk requirements as may then exist. A nonconforming use that has been changed to a conforming use or been granted a use variance to carry on a different nonconforming use shall immediately and forever lose the limited protection afforded by this section. No nonconforming use shall be reestablished if such use has been abandoned or has been changed to, or replaced by, a conforming use. Intent to resume a nonconforming use shall not confer the right to do so. Discontinuance of a nonconforming use for a period of one year or more shall create a rebuttable presumption of abandonment. It seems to me that Mr. Zgonena needs to obtain a use variance from the Zoning Board before any subdivision can be contemplated. He also needs to demonstrate that one of the non-conforming uses was not abandoned. I do not understand why the Zoning Code was not consulted. Further, I couldn’t follow the SEQRA process … Where was the decision made that a short form EAF was appropriate for this application? How was lead agency established? The Zoning Board did not discuss it, and the Planning Board didn’t either. The Planning Board attorney, in the second meeting of the Planning Board on this matter, noted several areas that needed clarification. There was no subsequent Board discussion, or action. The proposed subdivision being looked at contains a flag lot, which the Village has long viewed as an undesirable planning element and not appropriate for the Village. Our 4-acre zoning is central to maintaining the ambience we all love in Tuxedo Park as well as our real estate value. I don’t think the Planning Board has the right to create a subdivision that could change and undermine our code. Thank you for your consideration and thank you for all of the work you do for the Village. Jim Hays commented that he felt that Mrs. Goodfellow had outlined most of the issues very well. He further stated that it seemed as though there was an overarching issue in what is convenient for a particular member of the community vs the Code and that variances in planning be made to convenience someone when they are, in fact, violating the code and inconveniencing other members of the community. He feels this is a mistake. The public hearing was then closed. Mr. Nugent advised that the issues with nonconformance and required variances were not issues that the Planning Board would determine. The BZA has already rendered their decision. He further suggested that a large number of variances when bringing noncompliant property into compliance with the Code. Chair Hanson stated that the issue of SEQRA had been addressed at the BZA when the application had been classified as a Type 2 Action. Mr. Regna commented that according to the Zoning Code section 100-20, houses are required to have a garage for at least 2 cars. It seems to him that the way the parcel is set up, there is a house on it without a garage and then there is a second structure, which is a garage. He wondered if it were not one of the items on the BZAs list, to consider whether or not this was a non-conforming arrangement. The way it is now, with the garage on the property, it could be used by whoever is living in the house that doesn’t have a garage. But if the property is divided and the garage is converted into something else or sold, then the main house would be denied its’ right to a garage as there is no other place on the property where one could be constructed. Chair Hanson asked Mr. Zgonena to confirm that the second building, closer to the road was a house and not a garage. Mr. Zgonena responded that his was hardly the only house in the Village that did not have a garage. He feels that this is really more of a lot line adjustment. Mr. Nugent interjected that section 100-20 referred to new construction and that this was not new construction. Mr. Regna responded that he felt it applied to old construction as well because if this was approved than anybody else who has a garage on their property would feel that they should enjoy the same freedoms and therefore be able to subdivide their garage and sell it. He feels this is a very bad precedent. Mr. Nugent reiterated that the code did not address existing or old residences. He further commented that the BZA has identified the structures as two residential units. In other words, the smaller one has not been labeled a garage. “Have you looked at it?” responded Mr. Regna. Mr. Nugent responded that it was not his observation but rather what the BZA and the Certificate of Occupancy said that mattered. Both buildings are described as residential units. What it looks like would not be determinative. Therefore, if somebody wanted to take their lot with an existing garage and subdivide off the garage, they would not be able to do it unless it was a similar application and that garage was already a residence. This decision will not authorize property owners with garages to somehow split the property and sell off their garages. Mr. Regna responded that he had a garage on his Mountain Farm Road property. If this goes through, and Mr. Zgonena’s garage is rented or sold, why couldn’t he then ask for the same thing? His garage only requires 3 variances. If he were to get a good attorney, why could he not come before the Board and do the same thing that Mr. Zgonena is doing, by parceling off the garage to sell or lease? He further commented that when Airbnb started, people had “poo-pood” it, suggesting that it would never come to Tuxedo Park, but now there are 5 residences with Airbnb clients renting space. Chair Hanson suggested that Mr. Regna was going off topic. Mr. Regna replied that this was his topic. He does not want to see other people using this application as a model to subdivide or rent their garages. This is what scares him. It sets a very bad precedent. Perhaps if the building were a glorious house or something, perhaps one could look the other way, but this is an old building with no porch or front door. In considering the planning and specifically what might happen as a result of this, he feels that it should not go through. Mr. Nugent responded that unless a garage had a Certificate of Occupancy, nothing like what Mr. Zgonena is proposing could be done with it. Mr. Regna wondered why he could not get one? Mr. Nugent responded that anybody with all the necessary approvals would be allowed to proceed and that they could ultimately “what if” every situation. The question is, however, is the Village or the BZA going to approve all of those applications? Board member Sherry Bishko inquired as to when the Certificate of Occupancy had been issued. Mr. Nugent responded that he had seen documents dating back to the 60s. In speaking to Mr. Regna’s point about the appearance of the structure, he further commented that this sounded to him like more of a Board of Architectural Review issue and he was not sure it was appropriate for the Planning Board to be making a decision based on appearance. He then reiterated that this application did not set any precedent for any other property owner to take a non-residential structure on their property and subdivide it off. Mr. Regna responded that it seemed to him that once there was a bad example like this one, with a structure that is not particularly attractive on a lot that is .4 acres requiring 15 variances, anyone with a good attorney might be able to come before one of the Boards and obtain the same thing. This concerns him greatly. There are over 100 garages in the Village. On a recent ride around Tuxedo Lake he noted that there were 41 garages and outbuildings that could theoretically be used as rental units or parceled off if this application is allowed to proceed. The Planning Board then went into a 30 minute Executive Session for the purpose of conducting an attorney/client discussion to receive legal advice with respect to obligations concerning conflicts of interest and recusal. When the emerged, Chair Hanson asked each member of the Board to determine whether or not they had any conflict of interests and could objectively review the application. All members stated that they believed they could objectively review the application. Board member Rob McQuilken stated that he had had a question for counsel regarding whether or not he conceivably might have a conflict. Counsel had advised him that he could in fact weigh in objectively. He further stated that although he had also been advised that there was no need for him the share with the public what the potential conflict was, he wanted to anyway. He went on to say that he would be bringing an application for a subdivision before the Board in the coming months. In many ways his application will be an inverse of what is being proposed in so far as it will result in a lot that exceeds Code provisions. Regardless, he has been advised that he can still objectively weigh in. The Board then voted 3-2 in favor of approving Mr. Zgonena’s application for subdivision, with Mr. Mincey and Mr. Regna voting against. Please be advised that the Village of Tuxedo Park Planning Board will hold a Public Hearing on Monday, October 17, 2016 at 7:00 p.m. for the purpose of reviewing a subdivision application submitted by Robert Zgonena involving parcel number 106-10-57.2 located on Ridge Road. The Public Hearing will be held at the Village Hall located at 80 Lorillard Road, Tuxedo Park, NY. The Village Planning Board met on Monday. September 12 at 7:30pm. All members were present. The applicant presented plans for the subdivision of his properties located at 18 and 20 Ridge Road. The project has received the necessary variances from the Zoning Board of Appeals and has met all bulk table requirements. Following some discussion, a public hearing was scheduled for October 19. A joint meeting ofthe Board ofTrustees ofthe Village ofTuxedo Park and the Village Planning Board will be held on Monday, October 19, 2015 at 7:00p.m. in the Village Hall, 80 Lorillard Road, Tuxedo Park, NY, for the purposes discussing the proposed Overton subdivision with the applicant. All 5 Board members were present together with the Board’s Engineer, Attorney, Secretary and the Building Inspector. 1. The Diem Application was considered for a lot-line change between 2 abutting parcels on Summit Rd. Attorney Jim Sweeney attested that both parcels were owned by Mrs. Diem and the purpose was to afford more play area to the lower house property. It was noted that the delineation tape, while emanating from a stone stanchion, would actually begin at an existing corner marker adjacent to the stanchion. With little discussion, the P.B. voted 5-0 to approve this lot line change and both parcels would remain non-conforming in terms of current area requirements. 2. The second agenda item was an application by “C.C. Road Tuxedo Park L.L.C.” Architect Alex Gorlin, Engr. David Higgins plus Atty. Brian Nugent appeared for the unnamed property owner of lot 101-1-11.1 on Camp Comfort Rd. The Village’s consultant George Janes explained the applicant’s photo-simulation submission showing the proposed flat-roof home on the ridge line and precipice of the parcel. He explained that the remaining trees would soften visual impact of the flat-roofed structure. Member Regna asked why the proposed home, as shown in the simulation graphic, is brown, and matching the tree-color, when the actual construction material was shown as white stone and far more visible. He also felt that looking up 300 feet from the East causway to the proposed house, above and across the lake, did not allow proper prospective. Mr. Regna further referred to the Village code which requires views from all relevant roads to be considered, which they were not. Specifically, views from Tower Hill Loop and Tower Hill Road were not included in the simulation study. The applicant stated that in deleting the Rain Garden, and substituting a grass-covered roof on the home, would save 37 of the 81 trees previously slated for removal and thus would help protect the view. Mr. Ellsworth, an attorney for resident Michael Bruno, questioned whether any part of the proposed house would pierce the skyline. Mr. Bruno explained the visual and historic importance of “Maxwell’s corner” and the entry from there onto the (now one-way) lake-side causeway. The proposed home, he felt, detracted considerably from the otherwise visual spectacle one enjoys upon reaching Tuxedo Lake. Resident Michele Lindsay also questioned the site plan and visual aspects. Village Attorney Rick Golden distributed an 11 page 11/3/14 Draft Resolution to the Planning Board members and proceeded to explain the “Limits of Disturbance” and the “Maximum Allowable Building Envelope” as a deed restriction relating to the specific area of construction. Not surprisingly, the vote was then 4:1 in favor of P.B. approval for the “Villa Inna” house project. Minutes of several prior meetings were considered and approved by the Board. Others were held in abeyance for review at the next P.B. meeting. A vote for adjournment was cast at about 10 PM. The Village Planning Board, with one absentee, met on Monday, September, 15, 2014 to address the Diem lot-line change and the C.C.Rd.T.P., LLC (Villa Inna) house application. Since the Diem’s attorney could not attend, the Hearing was postponed until October 3. Villa Inna matters began with the positioning of the garage, as the BAR had previously expressed a dislike for the 3-bay wide garage door being the first eye encounter upon approaching the proposed home. This matter was deemed within the province of the BAR, and was not formally considered by the Planning Board. However, a suggestion of 3 individual garage doors, rather than a less aesthetic single, was mentioned. The applicant’s recommendation for blasting was a concern, yet the prolonged noise of chipping was considered equally disruptive. Additional photo simulations and soils analysis work was discussed for visual and safety consideration. The Village Planning Board convened on Monday August 18, 2014 at 7:30 PM. Two members were absent and Deputy Chair Rob McQuilken presided. The Keating application for a new home on Cliff Rd. was discussed with the Village Attorney, Village Engineer and Building Inspector. Mr. Golden presented a revised Resolution document and some consideration was given the roadway easement, “turn-around” provision, paving, tree cutting, “sun-set” clause, drainage, lighting, sewer, water and the Buildable Envelope. The vote was 3:0 in favor of approving the Keating application. The Village Planning Board met on June 16, 2014 to discuss the “Villa Inna” project. All members were in attendance. The applicant explained that fewer trees would cut than those ribbon-marked on the property. The saving would be approx. 35 trees. A “Cultex” system is designed to collect all rain/snow water that might run down that driveway scheme or from Camp Comfort Rd. In accordance with Code 100-9-B2 the applicant will show the ratio of deck area to ground floor living area. Atty Golden explained a request for BZA interpretation of Local Law revising 100-13-A. He also reminded the applicant of the need for Soils Stability analysis. The applicant expressed concerns over delays in the application process. The down-hill neighbors then mentioned several of their concerns including a desire to prohibit blasting on the Villa Inna site. A design for collecting rain water on the house roof was also shown and explained. After a short discussion, the meeting closed at about 8:45. The Village Planning Board met on Tuesday May 19, 2014 with the sole agenda item of considering issues at the “Villa Inn” (CC-TP) site on Camp Comfort Rd. The perimeter and vertical projection of this proposed new home had been “tethered” and delineated for the Board’s edification. Proposed final elevations were posted, but present elevation figures were missing. A new shorter driveway route was presented and the “Rain Garden” concept had been replaced with a roof-top garden to absorb rain and melting snow. “Soil stability” computations are still needed as well as a landscape plan. The meeting was closed at about 8:30 pm since there was no other business to conduct. The Village Planning Board met on Monday, April 21, 2014. The “Villa Inna” application of Camp.Comfort.Rd. Tuxedo Park, LLC was considered, with Engineer Higgins explaining the garage modifications, one acre disturbance, re-flagging, tree removal, driveway approach, drainage, rain garden, sewer connection, etc. The George James photo-simulation was also considered together with the effects of considerable tree removal adjacent to the proposed home. Building Inspector Ledwith and an abutting neighbor both recommended a post and ribbon, or wire-frame delineation of the house’s exact location, shape and mass. The architect mentioned use of German no-glare glass, roof plantings, mahogany and granite facing, Cultech dry wells and other details. Also discussed were timber rattlesnakes, the absence of a replanting plan, the need for a soil-stability analysis and a tree protection plan. A motion was made to close the meeting and all 4 members in attendance voted aye before moving to an Executive Session. The Village Planning Board met on Monday February 24 to hear the Keating and “Villa Inna” applications. Mr. Keating’s engineer discussed with the Village Engineer, Mr. Messer, matters including the 3 dry-wells, their overflow spreader and an incoming water supply line. Percolation tests at the 3 dry-wells have not been performed, but are required. The proposed propane tank location does not yet appear on their site plan. The rear retaining wall, tree removal, hydrant relocation, cabana, DPW turn around, and availability of water for percolation. tests were also discussed. The “Villa Inna” Camp Comfort Road LLC application was handled primarily by Attorney Nugent and Engineer Higgins for the applicant. The BAR’s consultant, Mr. Janes, attended in regard to a photo-simulation of the site’s Easterly view. The new driveway plan emulates that of a prior applicant, but seems to sacrifice many existing trees. It was noticed from the simulation “visuals” that the subject home appears much larger than, and of an entirely different style than, the adjacent homes. Concerns about breaching the skyline, preserving trees, light pollution, drainage, cut/fill ratio, blasting, tree re-planting, detention or whether Local Law 7 allows a cantilevered design were all discussed. Mr. Janes asserted that the present “simulation” does not include the loss of trees attendant to carving such a lengthy driveway. The Chair suggested the applicant bring his project to the BAR for initial consideration. The Village Planning Board met on Monday Dec. 16 2013 at 7:30 p.m.
Mrs. Anne Madden was welcomed as a new Board member replacing William Westby. Item 1 was a request by Mary Diem to realign the lot boundary between her 2 properties on Summit Road. Attorney Jim Sweeney agreed to have the new boundary staked for proposed Planning Board inspection. Item 2 involved the Keating application for a new home on Cliff Road. Many engineering issues and considerations were cited by Village Engineer Messer which require addressing. These include the drainage system, retaining wall, foundation, road width, hydrant location, site disturbance, fill, tree-removal etc. Item 3 was the Camp Comfort Tuxedo Park LLC application for a new home with siting issues. Storm water, tree-removal, cut/fill requirements, driveway, berms, photo simulation, garage location, cantilever design, site disturbance, and visibility were all discussed. The meeting adjourned at about 9 p.m. The Villahe Planning Board met a t7:30 PM on November 4, 2013 with a quorum of 3 to hear the application of “ C.C. Road Tux Pk, LLC” for a new home at the ex-Heibel site on Camp Comfort Road. Engineer David Higgins displayed a preliminary site plan, but the Board showed concerns for major disturbances in driveway excavations and embankments. Although the building foot print had been flagged, there appeared to be concern for the 1st floor being cantilevered over the precipice. Matters of view shed, tree preservation, skyline, water pressure, cut-fill, driveway sight-distances, storm water, blasting, driveway course and width, true house elevations, plantings, school traffic, basic architecture and terrace deck level were all briefly discussed with the applicant’s 5 representatives. The Planning Board, together with B.I. John Ledwith, Secty. Desire Hickey, Atty. Rick Golden and Engineer Rich Massey adjourned at about 9 PM. The Village Planning Board met at 7:30 PM on Monday October 7 to discuss “Villa Inna” a proposed new home on Camp Comfort Rd. said to be a project of “Camp Comfort Road Tuxedo Park, LLC”. All 5 Board members were in attendance. The applicant was absent, and his attending representatives declined to release names of the LLC partner(s), but Attorney Brian Nuggent said he represents the property owner. Architect David Higgins explained the plan for re-locating a home site farther South of the prior proposed Heibel site on the same lot. The new proposal depicts a 30’ tall home with a good portion of the structure cantilevered over a precipice and generally facing East toward Tuxedo Lake. The Board’s obligation is to review this proposal with regard to the Code’s Ridge Line and Precipice regulation taking into account topography, utilities, driveway, lot disturbance, safety and other considerations. SEQRA and deemed to be a Type 2 application not requiring an EAF analysis. The Board voted 5:0 in favor of this determination. Further discussion ensued, including the Village Attorney and Building Inspector, on matters germane to siting, access, neighbor considerations, staking the house foot-print and expected visibility from the Lake and public roads. After a short discussion of the Village’s new Planner, the meeting closed at about 8:30 PM. The Village Planning Board met at 7:30 on Monday August 5, 2013 with the purpose of interviewing a candidate for “Consulting Village Planner”. Also attending was Building Inspector John Ledwith. Mr. Ted Fink AICP introduced himself to the full Board and presented a CV/Resume document from his firm Greenplan Inc. of Rhinebeck, NY. The Board was most interested in Mr. Fink for his potential near-term assistance with the Overton Subdivision’s Environmental Impact Statement rather than“Planning” from the standpoint of re-zoning, drafting Code or creating a Master Plan. Mr. Fink appears to have many years of experience with local municipalities in land use and environmental considerations. The Chair will contact a few of Mr. Fink’s references together with another possible candidate before a formal consideration is rendered. Ted Fink - Greenplan Inc. The Village Planning Board met at 7:30 on Monday July 15 and welcomed new member Billy Mincey. Neither the McKenzie nor Overton matters were represented, and the Board considered only the "lot-line change" application of Robert Simon. His demolition application is before the BAR and the intention is to then merge 2 lots. All 3 conditions for a lot line movement were deemed met and the Board voted 5:0 in favor of approval. Minutes of 2 prior meetings were considered and approved with minor amendments. The meeting then adjourned at 8 PM. Simon – Lot Line Change – 53 Tower Hill Road and 82 Clubhouse Rd. The Village Planning Board met on Monday, May 20, 2013. Chair Joann Hanson and member Bornstein were absent and Deputy Chair Rob Mc Quilken opened the meeting at 7:30 PM. Mr. Keating appeared before the Board with his plan for a home and pool on Cliff Road. He agreed to place 2 helium balloons at 36” height designating the Westerly corners of his proposed home and demonstrating compliance with the Ridge Line and Ordinance Precipice Law. The Board and applicants discussed topsoil cover, road contribution, water and sewer connections, fencing, siltation, transformer on pole, drainage clean fill requirement, cellar sump pumps, pool draining, lighting, 250’ roadway paving and 75/20 law. The Board agreed to view Mr. Keating’s “balloon test” on Saturday morning from points on the West side of Tuxedo Lake. The Village Planning Board met on Monday April 15 at 7:30 PM. 4 of the 5 members were present together with the Village Building Inspector, Attorney, Engineer and Secretary. Regrettably, Secretary Mary Grimmig announced her upcoming move to Vermont and consequent resignation from the Village Office staff. Mr. Keating appeared before the Board with his Engineer to present his new site plans for the ex-Riordan lot on Cliff Road. The ensuing discussion covered retaining walls, pool, runoff detention, sewer and water connections, fences, garages, trees, ejector pump, neighbor’s property access, road width, Ridge Line/Precipice law, road frontage, paving, pool water discharge, pole transformer, underground electric, house elevations, cuts and fills, SEQRA Type II designation, schedule with BAR, and an easement for DPW turn-around. The applicant agreed to mark trees for visual affirmation of RL/P compliance from public roads across the lake. An attorney-client session was followed by consideration of 3 sets of prior PB meeting minutes. All were approved as amended and the meeting adjourned at about 9:00 PM. The Planning Board met at 7:30 PM on Monday Dec. 17, 2012 with all 5 members present. Mr. Garafano, Mrs. Kathelene McNamara and the recent Humphrey-house purchasers were present. Also attending were the Village Building Inspector and Recorder plus the Board’s P.E. and Attorney. A review of alternative subdivision plans for the Overton property were displayed and discussed. Specifically, a 9-lot and 7-lot arrangement were revealed by the applicant’s Engineer and Attorney. Discussion was confined to lot lines, internal roadways, set-back from wetlands, driveway approaches, lot geometry and separation of houses. The Overton Subdivision Application is in its FEIS stage and Mr. Overton’s professionals are preparing that document while also exploring alternative lot arrangements to mitigate some of the Village’s concerns. Board members seemed pleased with the effort and direction of Mr. Overton’s team. However, the applicant was reminded that there are still many other issues including storm water pollution, water pressure and volume, wildlife, severe slopes, runoff retention, staging etc. which will need addressing regardless of which lot layout plan is chosen. The Board then addressed several outstanding sets of minutes. Most were accepted and approved while a few were withheld for minor considerations. The Village Planning Board met at 7:30 on Monday November 19, 2012 to discuss the Overton Subdivision at Camp Comfort and Mountain Farm Roads. The Board, with one absentee, listened and considered the applicant’s modified plan for 9 building lots in lieu of the 10 lots originally proposed. Several homes were re-sited away from wetlands and prohibitive slopes. their new concept and offered that it would reduce site disturbance, diminish impermeable surfaces and make better use of the old, but existing, Blair Estate entry road. The Board and its advisors seemed to feel the new arrangement was an improvement except for the need to create numerous driveway easements, a wetlands crossing required for one lot and an apparent garage-only house access on most lots. The meeting was adjourned at 8:35 PM and an Executive Session was held with the Board’s Attorney. The Village was represented by its full Planning Board, Building. Inspector, Attorney and Engineer. The applicant’s team consisted of two Chazen Engineering personnel and Mr. Overton’s attorney. Trustee Alan Heywood also was present, and a letter from the Garafanos was entered into the record. The Chair, having led a few Board members and Attorney Golden through the subject property, suggested a revision to the lot layout possibly involving several troublesome lots. It was revealed that the Trustees are not supportive of changing to an “active” water system (pump pressure to augment static head pressure) and seem to favor the conventional gravity reservoir tank approach. Other topics arose including endangered Timber-rattlesnakes, possible use of the old Blair entry drive as an access road, and questionable retention and detention facilities to protect Tuxedo reservoir. Extensive swamp land, severe cuts and fills, the need for numerous deed restrictions and the question of “bonding” the promised public improvements were all raised on the record. The Board then met in Executive Session with its attorney and closed the open forum portion of this Public Hearing. Two weeks remain for written public comment on the Overton DEIS and Site Plan matters. The Village Planning Board met at 7 PM on August 20 for a continuation of the Overton Subdivision Public Hearing. Topics were limited to the SEQRA DEIS environmental document and the creation of 10 specific building lots on 63 areas. One Board member was absent, and the applicant was represented by attorney Van Tyle, Mr. Round of Chazen Engineering and a water system engineer. An explanation of the new potable water-system design model ensued, and questions were asked about its operation and improvement level. The proposed 3-pump system would run continuously at peak demand times maintaining an added pressure head in the Mountain Farm/Camp Comfort water pipe network. Also, the present reservoir tank would be maintained at its full capacity of about 92,000 gallons, and hence at a higher static pressure for domestic water customers. Fire flows, however, could not be provided by the pump system. Questions from the Board about costs, maintenance, leaks, chlorine carcinogens, booster pumps etc. were addressed and discussed. Documents from Village Planners Barton & Loguidice together with an engineering review from Weston and Sampson became a part of the Public Hearing record. Letters from two affected neighbors were also received expressing doubts and concerns about the new 10 lot proposed development. Some questions arose from the public, but most matters were raised by the Board, Building Inspector and Attorney. Village attorney Rick Golden stated that typically a sub divider will oversee the construction of common-elements infrastructure, but the Overton Plan does not provide for coordination of traffic, utilities-installation, soil displacement, dust control, water main extension etc. Ms. Van Tyle offered to address this situation since the applicant lives so far from the activity. Also, Mr. Golden raised the issue of regulations not permitting disturbance of over 5 acres simultaneously. This restriction may make it difficult for several of the 10 lots to be developed concurrently. The issue of Storm Water Pollution control was discussed too since the Rain Garden approach appears very failure-prone if not precisely designed, built and continuously maintained. The Board felt other, more reliable, methods of runoff retention, filtration and absorption are available without the burdensome mechanical requirements and extensive record-keeping requirements of proposed cisterns and rain-gardens. A potential combination of certain lots might alleviate some of the complications with wet-lands, storm water pollution, awkward lot lines and unusual access drives. Trustee Heywood was present and advised that more concise information should be available to the Public concerning the entire Overton Subdivision project. The Village website will be the vehicle for distributing this information. The Village Planning Board held a Public Hearing on May 21, 2012 as a forum in regard to the Overton Subdivision Application. Thoughts and concerns of neighbors and other interested parties relating to the Overton Application and its DEIS document, were heard by the Applicant and the Planning Board. For the applicant were Ms. Van Tyle attorney and Mr. Chris Round Planner. For the Village were Chair JoAnn Hanson and the 4 Board members plus Attorney Golden, Building Inspector John Ledwith, Planner Chuck Voss and Engineer Richard Messer. Neighbors expressing views included the Garofanos, the MacKinnons, and TPS Headmistress Kathleen McNamara. Issues discussed included wetlands protection, in-home hydronic tanks and pumps, cisterns, sand filters, altitude valve, questionable water pressure and volume for domestic and fire purposes and the Blair estate entry pillars. Also covered were potential issues with sewerage, storm water pollution, Patterson Brook erosion, potential reservoir impacts, I and I study, timber-rattlesnakes, bog turtles, soil banking, unusual site plans for lots, terrain alteration, pump station improvements, sewer moratorium, cistern depths, utility pipe sizes, domestic water pressure and quality, Ivy Road modifications, runoff, lack of repairs on Mtn. Farm Road and reference to ex Head Master Jim Berger’s letter of 2010, construction noise and site disturbances. There will be no meeting in June/July concerning this matter, and the next scheduled session is Aug. 20, 2012. The meeting ended at approximately 8:40 PM. The Public Hearing remains open. Written comments will be accepted until Aug. 20th 2012 and should be addressed to Planning Board Chair JoAnn Hanson or Building Inspector John Ledwith at Box 31 Tuxedo Park, NY 10987. Respondents can address, pro or con, any aspects of the 10-lot Subdivision Plan and/or the Overton Draft Environmental Impact Statement. Both are available at the Village Office, TP Library and on line at the Village website www.tuxedopark-ny.gov. To view a copy of the DEIS please click here. The Village Planning Board met on Monday May 14, 2012 at 7:30pm to further consider Mr. Overton’s 10-lot Subdivision site plans and DEIS environmental document. Ms. Van Tyle, Attorney, Chris Round Engineer and his associate all represented the applicant. 1.) Discussion opened on the lots seemingly affected by wetlands #1, 4, 5, 6, 7. The Board seemed uncomfortable with the proximity of homes to stagnant-water swamp-like terrain. 2.) The applicant offered to grant access easements for existing utility conduits on the subject property. 3.) The applicant’s attorney stated Mr. Overton was not a Developer and preferred to create the lots and sell them. However, Ms. Van Tyle further stated that the applicant will not decide now on installing extensions of the sewer and water mains. 4.) Mr. Overton’s engineers, in presenting a power point summary of the technical aspects, showed illustrations of bio-retention methods like: sand filters, vegetated swales, cisterns, porous paving, rain gardens, green roofs and tree pits. Questions were raised at how effective these retention methods really are in a long-winter climate coupled with shallow soil cover, surface and sub-surface rock and with several wetlands already unable to discharge their water to any absorbing strata. 5.) Lot 4 was discussed as an exemplar, but topography, house location, driveway approach and the need for overflow swales from the sand filter did not seem to bolster the assurances that bio-retention would work on this site. It was also revealed that sand-filters require regular and timely maintenance and that a layer of Fall leaves, not removed, would effectively impede the settling and ground absorption from sand filters. and planning issues relevant to the proposed Overton 1 0-lot subdivision and site plan application. scheduled for May 21,2012 to consider that document. between Camp Comfort and Mountain Farm Roads all adhere to Code requirements for size, topography, inscribed area, road frontage and other dimensional requisites. surfaces, driveway slopes, bedrock, viability of storm-water retention tanks, and site aesthetics. created new lots to others who might develop them. Another discussion ensued concerning the geometry of several lots and whether the lot lines were optimally oriented with regard to the access road. dry land rather than building homes directly surrounded by wetland waters. water pressure, water volume, street lighting or off site storm water control had been offered by the applicant either. Easements over the proposed lots were considered for certain lateral connections. slopes. The conversation switched to protected species like t11e Timber Rattlesnake which were said to be denned on property adjacent to the subject 60 acres. Click here to view .pdf. The Village Planning Board met on Mon March 19, 2012 at 7:30 PM. Their agenda had been altered, and a discussion of the Overton subdivision was postponed. Only one other matter stood before the Board, the Niblo application for a new home on Cliff Road. All members were present in addition to a substitute Village Attorney, Engineer, Building Inspector and Recording Secretary. The Niblos were present with their Architect and Engineer who introduced the new site-plan showing a proposed house location moved South another 15 feet to accommodate the Board of Architectural Review’s requirement for avoiding a direct road view of the garage doors. Due to the steep slopes of this lot; swales, retaining walls, water courses, spreaders and water diversion from the septic area were covered in some detail. Letters to and from the Engineers covered 17 issues dealing with driveway sight distance, detention tanks, safety and retaining walls, septic adequacy, well-to-septic distance, fire and emergency access, neighbor notification, Ridgeline-Precipice ordinance, percolation data, building envelope, set-backs, rights-of-way, storm water management, impervious surfaces, revised cost estimate, cut and fill activity, Orange County Health Dept approval, lighting, transformer pad location, grading and siltation fencing, propane tank, confirmation of the house supporting 3 bedrooms maximum, and the need for signatures and stamps on all sheets of the submittal. A vote for approval raised 4 ayes and 1 nay from the PB, and the application passed subject to 8 conditions needed for completion. The Village Planning Board met at 7:30 PM on Monday March 5 with all 5 members in attendance. The single agenda item was consideration of "completeness" concerning Mr. Overton's Draft Environmental Impact Statement (DEIS) for his proposed subdivision and site-plan application. This project involves creation of 10 new building lots on Camp Comfort Rd. and Mountain Farm Rd. from his 70 acre property surrounding the Tuxedo Park School. The Planning Board was supported by its Engineer, Attorney, Planner and the Village Building Inspector. Trustee Zgonena attended the session along with one affected resident and the new School Head Mistress. Applicant Overton was represented by attorney Jennifer VanTuyl and Planner Chris Round. Their DEIS is a voluminous document covering dozens of issues from water and sewer to flora/fauna to traffic and blasting. Atty Golden explained again that the review process, at this stage, involves determining whether the applicant ignored or misinterpreted any of the Scoping Document's environmental issues. The test is whether or not the Overton documents address specific listed concerns and not whether the proposed solutions are optimum as yet. Web posting and hard-copy availability of the DEIS were discussed. Some comments were made concerning the lack of consideration of the Village's Infiltration and Inflow problems within the sewerage system and whether the Project Sponsor was willing to share costs on necessary upgrades such as new water and sewer facilities. The lack of a restoration plan for existing deteriorating walls and the original Blair entry stanchions was also raised. After additional exchanges, the Chair called for a vote and all 5 members moved to accept the Draft as "complete" for public evaluation and comment. Due to Ms. VanTuyl's schedule, Chair Hanson called for a Public Hearing on April 21st with a start-time of 7 PM rather than the normal 7:30. Interested parties may peruse the entire DEIS submission at either the Tuxedo Park Library on Rt 17 or at the Village Office. An Executive Summary provided by the applicant is available here on TPFYI. The meeting was adjourned at 8:40 PM on a vote of 5:0 . The Village Planning Board met on Monday February 6 at 7:30 for its regular meeting. Four of the five members attended together with the Secretary, Village Attorney, Village Engineer and Building Inspector. Mr. and Mrs. Niblo appeared with architect Ferraro concerning development of their lot on Cliff Road. Primary issues were the septic system, which requires Orange County Health Department approval; run-off and its effect on erosion and down-hill properties; he absence of perc-test data in the leach field; and cut/fill depictions on the site plan. Engineer Messer listed a number of further technical matters needing resolution or definition including dry wells positioned below the water table, concentration of drainage flows, missing percolation pit representation on the plan, out of limits water well, improper scale, fire truck access and several other concerns. Attorney Golden mentioned driveway sight distances and yet-undefined easements requiring addressing. It was suggested by the Chair and Building Inspector that Engineers for the Applicant and Village should meet independently and try to resolve these questions before returning to the PB meetings. Mr. Ferraro asked how long approval would take, but since all of the issues are his to resolve, it was not possible for the Board to give an accurate prediction. Next the Board conversed privately with Attorney Golden on other Village topics and adjourned the meeting at approximately 9:00 PM. Please be advised that the regularly scheduled meeting of the Planning Board on January 23, 2012 has been canceled due to the lack of any agenda items. The next meeting of the Planning Board is scheduled on February 6,2012 at 7:30 p.m. If you have any questions regarding the meeting schedule, please contact John Ledwith, Secretary to the Planning Board at (845) 351-4745 ext. 11. The Tuxedo Park Planning Board held 2 consecutive meetings January 9 and January 10, 2012 in order to interview 8 Planner candidates for intermittent service to the Village in accordance with varying needs. Currently the only project before this Board, which requires professional planning assistance is the Overton subdivision for 10 building lots around the Tuxedo Park School. Four of the 5 Board members were present at both interview sessions and the Chair allowed roughly 10 minutes for each candidate's introduction and 20 minutes for questions and discussion. Mayor Tom Wilson was actively present for both sessions as well. Large, medium and Sole-Proprietor Planning firms were included in the mix of candidate companies. Arrangements for these interviews were made chiefly through the efforts of Building Inspector John Ledwith and Chair JoAnn Hanson. The Planning Board is to sort through the applicants' proposals and oral remarks in an effort to recommend the top 2 or 3 firms to our Board of Trustees at their next meeting. It is expected that developers and subdivision applicants will, under SEQRA environmental review regulations, by required to pay for the Planning expert's review and analysis of Impact Statements, site plans and other germane submissions. No costs should accrue to Village taxpayers unless the consultant Planner were to be used for the Village's own municipal matters such as Code revisions, utilities studies, road or dam construction etc. The Planning Board has no knowledge of any such intentions on the part of the Trustees. No other business came before the Planning Board on either evening. Their next scheduled meeting is Jan 23. Please take notice that the Planning Board of the Village of Tuxedo Park has rescheduled its January 2, 2012 regular meeting to January 9, 2012 at 7:30 p.m. at the Village Hall, 80 Lorillard Rd., Tuxedo Park, NY 10987. The purpose of the meeting is to interview applicants for the position of Village Planner. The Village Planning Board met on Dec 19 2011 at 7:30 with 4 of its 5 members present. 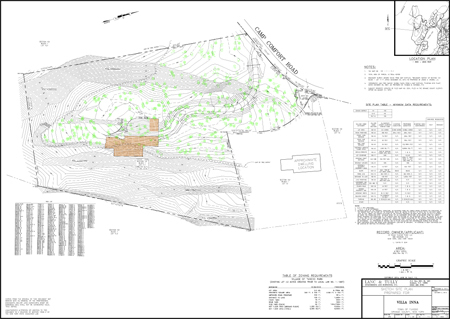 The Niblo application for a new home on Cliff Rd was discussed in conjunction with their preliminary site plan dated December 7, 2011 and the subsequent location "staking" of the lot. Architect Ferraro fielded questions in the absence of Engineers Pietrzak and Pfau. A special hardship variance had been granted by the Trustees allowing well water and septic in lieu of Village utilities. The Planning Bordss Engineer Mr. Messer expressed concerns about test pit locations, elevations, storm water impingement and other aspects of the septic system. He also suggested that holding tanks or other storm water detention systems may be needed. Since the septic leach field is of limited area, the Board's consultants discussed a possible deed restriction for no more than 3 bedrooms in the home. cut and fill for the designated house location, garage orientation, driveway materials, runoff, disturbance, septic tank vulnerability, transformer location, possible need of retaining walls, BZA variances, and some notes on the Plans that were questionable. The Planning Board then initiated a short Attorney/Client session followed by an open discussion of the interview process for a new Village Planner. Finally, the Board reviewed 3 sets of Minutes from November and December, all of which were approved. The Village Planning Board met at 7:30pm on Monday December to consider the Niblo application for a new home on Cliff Road. With 1 member absent, the Board convened together with Atty Golden, Engr Messer, Bldg Inspector Ledwith and Secretary Grimmig. The Niblos had received a special hardship variance from the Village Trustees permitting a septic system and well water in lieu of municipal utilities. Architect Farr introduced a preliminary revised site plan attempting to slightly relocate the home and septic field for better use of the sparse lesser-slope areas. Topics of visibility, health, site disruption, retaining walls, storm water runoff etc were discussed. The conclusion was that the Niblos are to revise the site plan, stake out the proposed house corner locations and advise the Board when ready for re-review. The Board then went into Executive Session for about 45 minutes. Minutes of several prior meetings were considered, amended and approved. The Village Planning Board met on Monday October 17, 2011 at 7:00 PM with Rob McQuilken assuming the Chair in JoAnn Hanson’s absence. The Niblo application for a new home on Cliff Road was again presented by Mr. & Mrs. Niblo with their architect John Farr. Mr. Farr submitted test-pit data suggesting that soil, rock and percolation conditions on the Niblos’ property were favorable to a septic leach-field. He also suggested using well water in lieu of Village water. The Board, together with its Engineer and the Building Inspector, explored other alternatives in attempting to find an economic and suitable method for connecting to Village sewer and water, as required by the Village Code. Several options were discussed, but all seemed to include extreme excavation and the traversing of neighboring property. Attorney Golden explained that the Niblos might appeal to the Village Trustees for a hardship variance, but the Niblos should first demonstrate that all other approaches have been explored and exhausted. b.) On this subject lot, the septic field would consume the only level area available, forcing the proposed home to be built on a very steep and rocky slope. c.)	The Village has a clear record of enforcing the Code and requiring municipal sewer and water hook-up at every site developed. d.)	Septic fields can malfunction and release very acrid odors. The proposed leach-field also appears to be in the path of significant Cliff Road storm water runoff. e.)	It was unclear whether the suggested house footprint could be considered within the prescribed buildable area. f.)	There might be a possibility of converting a neighbor’s “house lateral” into a “sewer main” by up-sizing the pipe over its existing course. Mr. Golden advised this step would require a Trustee variance as well. g.)	Mr. Golden also made clear that the Planning Board cannot give guidance as to the Trustees’ requirements for any variance. The Niblos should meet with that Board and discuss the issues directly since the Planning Board is not empowered to grant waivers. The Village Planning Board met at 7:30 on Monday October 3 with all 5 members present plus the Board Attorney, Building Inspector,Village Clerk and Village Engineer. The Niblo application for a new home on Cliff Road was considered with Mr. and Mrs. Niblo and their architect John Ferraro present. At issue is their request for a septic field and water well in lieu of the Code-required municipal sewer and water connections. The subject property is steep and rocky without direct access to utilities, and the applicants emphasized the costs of blasting and laying pipe to comply with Village Code. Mr. Ferraro stated the cost estimates he had received put the price of water and sewer hook-up with an ejector pump at $88,750. Board of Trustees approval would be necessary to vary Code requirements and allow well and septic alternatives. Planning Board members considered septic systems to be problematic in rocky soil, and it was mentioned that effluent might reach the Tuxedo reservoir if percolation were not ideal or the system were not maintained. Odor and well contamination have been known to accompany imperfect septic systems too, as was raised at the prior meeting on this matter. Architect Ferraro seemed convinced that the site plan location for a septic leach field was not rocky and impermeable, although the rest of the parcel would require extensive blasting to run sewer and water piping. The Board's consultants suggested the Niblos perform percolation tests with a back hoe and engineer on the site, and also that they might petition neighbors for permission to lay connecting pipe through their properties. The applicants agreed to perform this study and to approach neighboring property owners as well. Since cost appeared to be the primary consideration, and stated construction value had been declared at $300,000., Mr. Ferraro was asked if he had done his due diligence of computing site work expenses before the Niblos purchased the parcel 106-1-65. He responded that he had not been retained to study these issues until after the Niblos bought the site. Progress is now somewhat stymied since the Board appeared to favor home construction on the flat location presently allocated for septic leaching rather than on the adjacent steep and rocky slope currently depicted on the applicants' site plan. Next, the Board discussed with Atty Golden the search for a Professional Planner to assist with subdivision applications and matters of ridge-line and precipice jurisdiction. Finally, minutes were circulated for 4 prior meetings, and these are to be voted upon at the next PB Meeting. The Village Planning Board met on Monday August 1 at 7:30 PM with all members present. The only agenda item was a new home application by Mr and Mrs Niblo of New City, NY. The Niblos were represented by their architect John Ferraro who submitted a site plan for a lot on the Westerly side of Cliff Road. 1. A septic field where sewer hook-up is required. 2. Depiction of the home on a steep slope differing 18' in elevation across diametric corners. 4. Garage doors facing front and the implication of rearranging for possible BAR concerns. 5. A feasible house relocation to the more level septic site if sewer connection is established. 6. The need for underground electric service, driveway slope review, and water line connection. 7. Determination of the maximum allowable building envelope. After a cooperative dialogue, and the review of February 7th minutes, the Chair called for, and received, a vote to adjourn at 8:30 PM. Ms. Bonnie Franson of Tim Miller Assoc. ; Engineer Carl Stone of Weston and Sampson and Atty Richard Golden. Ms. Franson, Weston-Sampson, and George Janes. Retaining walls along Mtn Farm Rd. Run-off and flooding of Mtn Farm Rd. At the close of review, and on advice of counsel and consultants, all 4 Board members present voted that the subject DEIS was not "complete" for public review and would require revision before distribution and a Public Hearing. Minutes were reviewed and the meeting adjourned at about 9:30 PM. The Village Planning Board met on June 20, 2011. The meeting opened at 7:40 PM with 4 members and without legal counsel. The topic was Mr. Overton’s Draft Environmental Impact Statement filed May 26th for a 10-lot subdivision at Mountain Farm and Camp Comfort Roads. Attorney Van Tuyl and Planner Chris Round represented Mr. Overton. The project encompasses many issues including domestic water sewer, I & I reduction, viewshed, wildlife, run off detention, historic preservation, etc. Viewshed information was directed to George Janes and other materials to the Village Planning Consultant Bonnie Frenson. Please be advised that the June 6, 2011 Planning Board meeting has been canceled as no building permit applications are ready for review at this time. Heibel – 101-1-11.1 – New Construction – Camp Comfort Rd. Please be advised that the regularly scheduled meeting of the Planning Board on May 2, 2011 has been canceled due to the lack of any agenda items. The next meeting of the Planning Board is scheduled on May 16, 2011 at 7:30 p.m. If you have any questions regarding the meeting schedule, please contact John Ledwith, Secretary for the Planning Board, at (845) 351-4745 ext. 11. The Village Planning Board met at 7:30pm on Monday March 7, 2011 with all members present. Neither Mrs. Harris, nor Mrs. O’Neal appeared to present their application for a revised subdivision of #55 and #57 Clubhouse Rd. The Board considered minutes of previous meetings, then listened to John Ledwith, Building Inspector, and Rick Golden, Village Attorney, concerning details of the pending application. The Heibel subdivision was discussed in the context of reviewing minutes. The Village Planning Board met on Monday February 7, 2011 at 7:30 to discuss the Heibel application for a new home on Camp Comfort Road. Deputy Chair Bornstein presided in the absence of JoAnn Hanson. Mr. Heibel and Architect Tobias Guggenheimer answered questions on retention chambers, lighting, construction sequence, and balanced soil/rubble displacement/re-placement, retaining wall engineering, storm water, etc. Mr. Guggenheimer expressed frustration at the time lapsed so far in pursuing his client’s project. The Board acknowledged his criticism, but reminded Mr. Guggenheimer that major design elements like soils stability, relocation of pool, topography, cut and fill analysis, storm water control, blasting, elevation changes, water and sewer hookups security bonds etc. had just been addressed by the applicant in the last few weeks. Mr. Guggenheimer expressed additional indignation at Village Engineer Rich Messer’s letter depicting 37 engineering, landscaping, and code-conformance issues still not resolved or verified. The Board confirmed that these loose ends were not new issues, but rather a culmination of Planning Board site plan requirements never addressed fully by the applicant. In a spirit of compromise the Board and Mr. Messer agreed to consider forestalling some of these requirements until the Board of Architectural Review phase. The meeting adjourned at approximately 9:30pm. The Village Planning Board, with 4 members in attendance, met at 7:30 on December 6, 2010 to discuss two applications for new homes. The Board formally acknowledged a Type 2 SEQRA status for this application on a 4:0 vote. Then, a second motion was considered to approve the set of 8 site plan drawings and the maximum appropriate buildable envelope. This resolution passed 4:0 as well. Mr. Chris Dindal, of the Wheelock Landscape Architecture firm represented Mr. Heibel, who did not appear. Three alternative plans were presented to address the excess excavation materials expected as a consequence of siting the proposed home on Camp Comfort Road. It was estimated that narrowing and re-aligning the proposed Southerly steps would reduce rubble by 500 cubic yards or so. Other topics such as trees, light pollution, spa, outside dining area etc. were also addressed. BI John Ledwith again suggested a color-coded cut/fill map similar to the Sendowski’s might be very helpful in understanding where the excavation and stock-piling of rubble would occur. The Village Planning Board met at 7:30 PM on Monday, November 15 to hear 2 pending applications. In the absence of Chair JoAnn Hanson, Deputy Chair Samuel Bornstein presided over the session. The Sendowski application for a home on Lookout Stable Road was considered first, and the Board discussed matters with the applicant's engineer, landscape architect and architect. Site plan modifications to accommodate the Tuxedo Fire Commissioners had been detailed on the site plan and were deemed acceptable. BZA variances had recently been granted for a diminished rear setback and more extensive porch area. Other planning items were reviewed including: sewage system, storm water control, transformer location, footing drains, runoff spreaders, retaining walls and a driveway material called RCA, Recycled Concrete Aggregate. Village fees were current and the cut/fill ratio was claimed to be near 1 to 1. After a few details are transcribed the applicant will appear for consideration of final Planning Board approval. Mr. Heibel was not present, but was represented by Architect Toby Guggenheimer who presented a reduced disturbance plan for the proposed home site on Camp Comfort Road. The Chair questioned what method of analysis had been used to determine the pool be moved 20 ft Southward. The Board expressed concern that the claimed 50% reduction in exported materials, while admirable, might come at a steep price in terms of project coherence and Board of Architectural Review aesthetic preference. The topics of soil stability, existing vs. proposed topography, soil-refuse transportation and a possible waiver from the Village Engineer were also considered. The Tuxedo Park Planning Board met on Monday October 18 at 7:45 PM with all members present. Mrs. Sendowski's new-home application was announced to have been deferred by the applicant shortly before the meeting. The second applicant, Mr. Heibel, was represented by architect Mr. Toby Guggenheimer and Mr. Chris Dindal of the Wheelock landscape architecture group. Discussion focused on reducing soil and rock excavation and its export over Village roads. It had been previously estimated the surplus extracted materials would require 400 to 600 truck trips in and out of Tuxedo Park. This activity had been deemed too disruptive to traffic, road surfaces and under-road conduits, so Mr. Guggenheimer proposed another plan, reducing excavation from 4300 cu yards to 2800 cu yards and distributing this excess soil, rock and debris over other portions of the lot. This approach would necessitate removal of about 40 trees on the South side of Mr. Heibel's property, which the Board felt was excessive. It appears a new plan will be devised reducing excavation, distributing some excess about the parcel and trucking a smaller portion out of the Village. The Board also emphasized its’ engineer's need for the Soil Stability Analysis before going much further. It was suggested that the pool might be moved slightly south to further reduce site disturbance, Mr. Guggenheimer agreed to consider this alteration within a new plan to be drafted. After a short Attorney / Client Executive Session, it was agreed that all formal communications between project professionals and Village professionals will be copied to the applicant of record as well. The Village Planning Board met on Monday, September 20, 2010 at 7:30 pm. All members were present. Both applicants who had scheduled appearances later cancelled, and the Board confined it's business to considering 2 sets of draft minutes before adjourning at about 8:15 PM. The Village Planning Board met on Monday August 2, 2010 at 7:30pm with 1 member absent. In attendance were Village Attorney Rick Golden, Village Engineer Rich Messer, Architect Guggenheimer for applicant Heibel, and Board Consultant George Janes. 1) Heibel: Although several view “simulations” were shown together with a tree survey; “site engineering”, “cut and fill analysis” and “soils analysis” were not submitted. The Board’s 3 main issues were a) whether the proposal structure would pierce the skyline; b) whether construction of the garden, pool and fountain would eliminate a visible swath of trees and c) whether the consequent site disturbance was acceptable. Village Engineer Rich Messer estimated 400 truck-loads of split or blasted stone would require removal from the building parcel. He also commented that no study of storm-water runoff has been received either. The Board agreed to re-visit Mr. Heibel’s site and Mr. Janes agreed to perform a further view simulation effort. Mr. Guggenheimer offered to hang fabric at the house location to emulate the structure’s mass. This could then be viewed from Tuxedo Lake, East Lake Rd. and Tower Hill Loop. 2) The Elene de St. Phalle Trust subdivision matter has reverted to a “lot-line change” due to the current DEC Consent Order involving our Tuxedo Lake dam. This tiny parcel of 276 sq. ft. is being annexed to the Tuxedo Club lands following a 4:0 vote by the Board after discussion with Attorney Rick Golden. The Village Planning Board met on Monday July 19, 2010 at 7:30pm. All members were present. 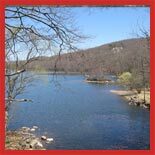 At issue was the transfer .02 acres of lakeside property from the de Saint Phalle Trust to the Tuxedo Club. Representative Geoff Isles explained the DEC mandated improvements to the existing berm/dam on Tuxedo Lake’s North end. The involved parties are Tuxedo Club, Village of Tuxedo Park and the de Saint Phalle Trust. Hence this property transfer, while small, would delete the Trust as party to DEC’s project. Attorney Golden advised that this transfer required a “subdivision” rather than a “lot line change” as the appropriate procedure for transfer. Mr. Isles agreed to fulfill the Code requirements for each at subdivision, and he will return in several weeks for Planning Board approval subsequent to a Public Hearing. The Village Planning Board met on June 28, 2010 at 7:30 pm. Board members Peter Regna and Robert McQuilkin were absent. Architect Tobias Guggenheimer was present to continue to discuss the Heibel application to build a new house on Camp Comfort Road. The Planning Board’s viewshed consultant Mr. George Janes made a presentation regarding his recommendations of the scope of the viewshed analysis of the property that is required under the new Ridgeline & Precipice Law. Mr. Janes recommended three specific public sights that he felt had the most prominent views or the property and therefore should be used as the basis of the viewshed analysis. Those areas were: the Tuxedo Road causeway; the area next to 44 Tower Hill Loop; the surface of Tuxedo Lake. Mr. Janes recommended using photos of the property from the three sights in both leaf on and leaf off conditions, combined with computer simulation to create the viewshed analysis of how the finished house would look from public areas in the Village at different times of the year. The Planning Board discussed other potential sights to be included in the analysis, but after being advised by counsel that under the law they could only use views from public Village roadways or the surfaces of the lakes, they agreed that the three areas recommended by Mr. Janes were appropriate. Mr. Janes also discussed Mr. Guggenheimer proposal to build a life size mock fa�ade of the structure on sight and taking photos of it from the various sights. Mr. Janes recommended that this idea would provide additional data for the viewshed analysis, including more information as to whether the structure would pierce the skyline. The Planning Board was agreeable to this idea. The Planning Board advised Mr. Guggenheimer that they were still waiting for engineering information on the limits of disturbance for the house, as well as the tree survey. They advised Mr. Guggenheimer that these items would be needed prior to the viewshed analysis because they were also important for determining the visibility of the project. Mr. Guggenheimer agreed to provide the engineering information and tree survey by the next meeting, and indicated they would begin to create the viewshed analysis as discussed. Mr. Sendowski and his representatives were present to continue to discuss his proposal for construction of a new home on Lookout Stable Road. Mr. Sendowski’s lawyer Alyse Terhune McCathern informed the Planning Board that they had been to the Board of Zoning Appeals and received variances for the proposed location of the house. She further informed the board that they had also recently been to the Board of Architectural Review for preliminary input on the design of the house, they were currently proceeding before the Board of Zoning Appeals for additional variances for the retaining walls, and they were now ready to proceed with the Planning Board portion of the application. Mr. Sendowski’s landscape architect Karen Arent presented the latest landscape plans and discussed the changes since the last meeting. The changes included a new driveway entrance design, small stone columns at the entrance with a hammered granite top, a guide rail wall over the driveway bridge terminating with taller stone columns with lights, and a reduction in the number of retaining walls from 3 to 2 walls. The board seemed generally in favor of the changes to the landscape plan but discussed whether the driveway design allowed access for emergency vehicles. They requested that the applicant get a letter from the fire department verifying it was sufficient for access in case of emergency. Planning Board engineer Richard Messer asked if recent drainage calculations had been done. Mr. Sendowski’s engineer David Higgins indicated they had drainage calculations that had been taken in 2003. Engineer Messer requested that they update the drainage calculations to fit the most recent plans and that they also update the sewage pump data to reflect the new proposed location of the house. Building Inspector John Ledwith asked about utility locations since there was no basement reflected on the plans. Mr. Sendowski’s architect Kevin Broadie indicated they were going to put in a full basement, a portion of which would be walkout, and would locate the utilities there. The board requested that the applicant confirm the feasibility of a full basement considering the potential for there to be a tremendous amount of rock on sight and Mr. Sendowski agreed to dig some test holes and perhaps reconsider the basement size if necessary. The board requested that the cut and fill analysis include the basement since it was not shown on the plans. Attorney McCathern asked questions regarding how to get a permit for blasting if it was necessary. Board attorney Rick Golden advised Ms. McCathern that an application for a blasting permit had to be made separately to the Board of Trustees. Mr. Sendowski and his representatives agreed to update the engineering information and other items requested by the board before the next meeting. It was noted that due to the Village Office being closed for the holiday on July 5, 2010, the next Planning Board meeting would be rescheduled to July 12, 2010. The Village Planning Board met at 7:35pm on Monday, May 17, 2010 with all members and consultants present. Toby Guggenheimer represented Mr. Heibel in his application for a new home on Camp Comfort Road. George Janes, a planner and practitioner of “photo-simulation” spoke of his ability to create an image of the proposed home at its proposed location. This “virtual” snap-shot could be presented from several locations such as the Lake, Causeway, Club and other public viewing-points. Mr. Janes explained that this type of analysis conveys Forms, Line, Color, Texture and Scale of the project. It also provides for mitigation means such as screening, relocation, camouflage, lower profile, lighting, and offsets. Mr. Guggenheimer indicated he had photos of the site from various viewing points, taken during leaf-off conditions, which is considered the preferred view-time. Mr. Bornstein commented that this view-shed photo-insulation may be awkward since we are dealing with a house design that may or may not be accepted by the B.A.R. Chair Hansen, Attorney Golden and Engineer Stone again emphasized the need for a cut and fill analysis, tree survey, soil analysis, landscape review and conformance with the Ridgeline/Precipice ordinance. The Village Planning Board met on Monday, May 3 with all members and consultants present. An executive session ended at 7:40 pm. The Heibel application for a new home on Camp Comfort Road was then considered with Tobias Guggenheimer representing the applicant. Mr. Guggenheimer suggested continuing his design and landscaping effort, but Chair Hansen and Attorney Richard Golden stressed the need for a View-Shed Analysis, Soils Stability Study, Cut and Fill Analysis, Tree Inventory and the like. Mr. Guggenheimer offered to erect posts and drape fabric to simulate the Westerly house facade for purposes of a View-Shed observation. Various methods of rock removal were discussed pertaining to the house footprint and driveway course. Elements of the Ridgeline and Precipice Code were examined as they were deemed to apply to the subject site and proposed structure. Other considerations such as access, driveway staging, tree replacement, exterior lighting, seasonal views, height limits, and the retaining of a View-Shed and Photo-Simulation consultant were also raised in discussion. The Board then reviewed and approved 4 sets of meeting minutes before adjourning at 9:10 pm. The Village Planning Board met on Monday April 19 at 7:30 PM with all members and professionals present. The Heibel application was considered, with Messrs. Guggenheimer and Wheelock representing that applicant. Board attorney Golden and Chair Hansen emphasized the Boards’ obligation to define the “maximum appropriate building envelope” which included both the Southern and Northern locations on this Camp Comfort Road property. Architect Guggenheimer rejected this stance and appealed that his client had spent $200,000 in design fees so far and would not consider the Southerly location. The Board and its professionals reminded Mr. Guggenheimer that he had not yet submitted a cut and fill analysis, soils stability study, grading plans, view-shed simulations and other requisites for his preferred siting. Several neighbors commented on the issue of exploring an alternative house site at the “Southern peak” of the lot. A minor discord among the Board�s members prompted an Executive Session with Atty. Golden. Following this private discussion, a motion was considered to include only the Northern house site within the “maximum appropriate buildable area”. The vote was 4:1 in favor of not including the Southern location in the Boards’ “buildable area” determination. The Village Planning Board met on April 5 2010 at 7:30 PM with all members present. Vanum Property which is said to be an LLC of Messrs. Umansky and Efremson, presented their Tuxedo Road site plan through Architect Collins. The applicant (Vanum) had been given Planning Board authority in 2009 to present their “Alexander Garden” home design to the BAR while siting information was gathered for the Planning Board. However, eight months had elapsed without any Planning Board submission by the applicant regarding water, sewer, electric, drainage courses, pipe repair, dry wells, access-easements, driveway repair, landscaping, tree identification or other site-specific elements. Instead, it appeared, the applicant had spent those months with the BAR and its Consultant shaping architecture and house location. There was a mild disagreement among the Board members as to whether following sequence-procedure was essential in light of the fact that the Gateway Overlay District law restricted the house location anyway. The Village Planning Board met on March 1, 2010 at 7:30pm with 4 members present. The Vannum application for a home in the old Alexander garden had been withdrawn from the agenda at architect Collin’s request. The Heibel application for a new home on Camp Comfort Rd. was considered with professionals Wheelock, Scrabble, Guggenheimer and Murray representing. Sequencing review between Planning Board and Board Of Architectural Review was discussed along with the Ridge Line and Precipice legislation, buildable envelope limits, runoff, vegetation and the removal of 115 trees. The trade-offs between separation from the neighbor’s house and the need for additional site disturbance was concluded. Driveway access is also still under study. The Overton subdivision and site plan application was next considered with Ms. Vyn Tuyl, Ms. Johansson and Ms. Montrose representing. Their 30 page draft scoping document of February 16 2010 was reviewed page by page. Several additions were made especially in regard to storm drainage, stream capacities, road and infrastructure, traffic utilities, lighting etc. Upon the Chair’s call for a vote, the Planning Board moved, 4:0, to approve the scoping document as amended. The Village Planning Board met on February 1, 2010 at 7:30 pm. Board Chair JoAnn Hanson was absent. Mr. Overton’s subdivision and site plan draft Scoping document was considered. The subject 10-lot proposed development would surround Tuxedo Park School and involves several potential environmental issues. Chazen Company and Jennifer Van Tuyl, Esq. represented Mr. Overton, who resides in Hawaii. Rick Golden, Esq., John Ledwith, Building Inspector and Bonnie Franson, Planner, assisted the Planning Board in evaluating the depth and breath of Mr. Overton’s SEQRA “Scoping” plan dated Jan. 28, 2010. Many environmental eventualities were hypothesized to evaluate their importance and relevance to Tuxedo Park. These items included traffic, road damage, storm water detention, potable water pressure and volume, sewage collection and “main” extensions, runoff collection, erosion, wet-lands, cut & fill, road dedication, neighbors’ concerns, fire protection, electric utilities, booster pumps etc. The Acting Chair, Sam Bornstein, entered concerns submitted by the absent Chair Ms. Hanson, and other Board members commented on nearly every Section of the 30-page document. The Village Planning Board met at 7:30 pm on Monday, January 4 with all 5 members present. Scoping document, which is now under consideration. The Board members and Building Inspector expressed interest in the capacity of Patterson Brook to carry runoff. Mr. Overton’s representatives will be enlarging the predicted footprint of each proposed home to about 5,000 sq. ft. for a worst-case hydrology study. Other items such as electric service adequacy, private vs. public roads, sewer pipe capacity, wetlands, fire protection etc. were also discussed in the context of “Scoping” this project. 5 sets of minutes were then considered, amended and approved. The Village Planning Board met at 7:30 on Dec. 21, 2009 with only the Witte application on its agenda. Subject to the BZA's variance clarification and many other constraints, the Board approved Mr. Witte's site plan. 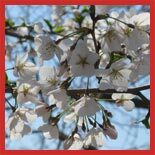 Limits of disturbance, tree maintenance stipulations and other conditions were included in the provisions. The next scheduled Planning Board meeting is Mon. Jan. 4, 2010. The Village Planning Board will meet at 7:30pm on Monday, December 21, 2009 to discuss the Witte application for new construction on Town Hill Loop. The Village Planning Board met on December 7, 2009 at 7:30 PM. All members were present. 1.) The Overton 10-lot subdivision application was presented by Chezan Engineers and Attorney Ms. Van-Tuyle. Both the Environmental Assessment Form and draft scoping document were discussed, and Village Attorney Rick Golden explained the SEQRA time schedule for review. Topics included wetlands, run-off, involved and interested agencies, road dedication, rain gardens, ridge-line district, municipal water and sewer limitations, borrow pit. 75.25 slope rule, 3:1 “i & i” reduction per DEC, 12 mo. build-schedule and blasting. Public comment is welcome January 4 to January 18, 2010 with a final “adequacy” vote February 1. 2.) Arborist Jim Prosutti spoke about the Witte home application and the tree-shrouding issue. The latest B.Z.A. variance allows for tree cutting and planting, but only with prior approval from the Village. Mr. Witte was not present, so no specific details or decisions were considered. 3.) Landscape Architect Wheelock and Architect Guggenheimer represented Mr. Heibel in his application for a new home on Camp Comfort Road. Topics included headlight intrusion, vegetated berms, excavation, topography, disturbance area, slopes etc. The applicant will be attending Board of Architectural Review meetings and will also provide the Planning Board with house renderings. The Village Planning Board met on October 19, 2209 at 7:30pm. All members were present. The Heibel application for a new home on Camp Comfort Road was presented by Tobias Guggenheimer, Architect, and Mr. Nugent, Attorney. The Board had individually walked this site and had observed the many markers delineating placement of home, garage, motor court, driveway, pool etc. Building Inspector Ledwith reported that the two zoning issues previously raised, front yard and building height, were met in the current application. Driveway access, parking, “turn-around” ability, and compliance with the new Ridge Line Ordinance were also considered. Drainage, cut & fill, slopes, neighbor accommodation and other related issues were also addressed. The Village Planning Board met at 7:30 PM on Monday October 5 with all 5 members present. Minutes of several prior meetings were considered and approved. Mr. Witte and his attorney, Mr. Nugent, discussed with the Board a letter, drafted by Chair Hanson, and intended to assist the BZA in modifying the applicant’s prior variance. That draft letter was revised with language agreeable to both Mr. Nugent and Village Attorney Golden. At issue is the screening of a proposed new home by existing trees, some of which now appear will be lost due to: collateral construction damage, storm water collection facilities, power lines and root invasion of existing retaining walls. Mr. Heibel, as applicant, was accompanied by Architect Guggenheimer, Attorney Nugent, and Landscape Architect Wheelock. The Village was represented by Engineer Messer, Attorney Golden, Building Inspector Ledwith and Arborist Persutti. A footprint and massing representation for a new home on Camp Comfort Rd. was presented. It was introduced as a 1 story structure with east side basement, detached garage, pool, plunge, court yard and garden. A serpentine asphalt driveway connecting two gravel motor-courts was also depicted. Mr. Guggenheimer stated that his new design was in full compliance with the Village’s newly adopted ridge-line criteria. Mr. Ledwith introduced two letters expressing opposition from neighbors and mentioned that a third neighbor had visited the Village Office with a short list of questions and cautions concerning the project. A fourth neighbor was present and questioned several aspects of the site plan as well. The landscape plan was reviewed briefly with Mr. Wheelock, and Mr. Heibel’s Team answered questions concerning site disturbance, visibility, overall height, retaining walls etc. Mr. Ledwith introduced two zoning issuing requiring legal interpretation. The Village Planning Board met on August 17, 2009 at 7:30 pm. All 5 members were present. The Witte Application for a new home on Tower Hill Loop was addressed in regard to important View Shed screening. Mr. Witte was accompanied by his attorney Mr. Hughes and Mr. Wade of Esposito Assoc. The Board discussed its prior site visit with the applicant and concluded that trees marked in red are potential and probable removals, while those marked in white would likely be damaged in the construction phase, but are expected to survive. The Village arborist will function as the responsible arbiter deciding which trees may be dropped. Engineer Messer explained his letter citing discrepancies between Mr. Witte's professionals. Mr. Wade will submit a revised site plan since the project now deviates considerably from the conditions previously imposed by the BZA in issuing its ridge-line variance. The applicant's Tree Protection Plan was deemed satisfactory by Mr. Messer as Village Engineer. The 10-lot Overton subdivision application was heard with 2 Chazen Engineers and a consultant from Cuddy Feder acting as representatives of Mr. Overton. The Planning Board as SEQRA Lead Agent proceeded to consider the Overton EAF Part 1 document. After the Chazin Engineers had explained each response on this questionnaire, Village Attorney Rick Golden advised that there was at least one issue (sewerage) which demanded an Environmental Impact Statement, so a Positive Declaration was called for. Significant matters of concern included drainage, water supply, sewer adequacy, wetlands, noise, land-fill accessibility, blasting, truck trips and the DEC main-extension Moratorium. The applicant was instructed to create a Scoping Document, which the Planning Board can edit to broaden or diminish its range of environmental concerns. Mr. Golden questioned the Engineers as to whether Mr. Overton was seeking purely a subdivision, or was he expecting an approved site plan for each lot as well. The applicant's representatives preferred to pursue both the division and the site plan approvals simultaneously. It was decided that in addition to submitting their DEIS to Involved Agencies, the Project Engineers would also provide that document to Interested Agencies such as: Town of Tuxedo, Fire Dept., Police Dept. and Ambulance Corps. The Overton Team will now revise their Site Plan and re-submit it to the Board with the necessary Scoping Document. The Siegel application for a home on Lookout Stable Rd. was next studied. Engineer David Higgins of Lanc and Tully represented the Siegels and explained their runoff plan of detention tunnels, "rain forest" areas, catch basins and conduits. He revealed that several perc tests and deep-soil tests had been performed on the site already. Mr. Messer's letter citing 29 related site issues was considered, and the applicant will respond to each matter. A Village water line runs across the property and is a source of some concern, so an access easement to the Village of Tuxedo Park will be required. Similarly, an easement to access the proposed sewage ejector pumps may also be necessary. It was not entirely clear whether the suggested surface water routing methods would impact the adjacent Fontana parcel, but this aspect will be further evaluated. Input and/or assistance on all 3 Applications was received from John Ledwith Village Building Inspector, Rick Golden, Esq. and his assoc. Jennifer, Rich Messer Village Engineer and Mary Grimmig Recording Secretary. The Village Planning Board met on Monday July 6 2009 at 7:30 PM. An application from Vanum Property was considered for a new home in the old Alexander garden at Maxwell’s Corner. The Board and architect Collins directed their attention to site drainage, home orientation, driveway access, water and sewer availability and view shed compliance. Mr. Richard Witte’s application for a new home on Tower Hill Loop was next on the agenda. Engineer Chad Wade and Attorney Brian Nugent attended to discuss tree preservation and Mr. Wick’s tree survey of the Westerly lot quadrant. Planning Board consultant James Presutti suggested methods for marking trunks, staging, safeguarding tree roots and monitoring excavated soil placement. These steps are being considered to comply with the BZA ridge-line variance essentially requiring no tree removal in the home’s rear yard. Further consideration was given to a Tree Maintenance Plan, detention reservoir locations, storm drainage and the need for a modified BZA variance. Following an attorney/client session, Fence Code drafting was re-opened. The Village Planning Board met at 7:30 pm on June 15, 2009. Board member Sam Bornstein was absent. 1) The Alderisio subdivision annexation of a “sliver” parcel along Patterson Brook is now altered to become a 2-applicant lot-line-charge. Mr. Deane and Mr. Alderisio as co-applicants may now bypass the formal subdivision process per Village attorney Rich Golden. Their application was approved 4:0. 2) Mr. Sendowski’s engineer John O’Rourke presented a revised site plan with the proposed home on Lookout Stable Rd. repositioned rearward to lessen site disturbance. A BZA rear-yard variance will be required, and the P. B. will support this application. Once all variance needs are assessed, Mr. Sendowski will apply to the BZA for relief. Other requirements including drainage, utilities and easements are still to be addressed. 3) Representing Mr. Overton, Mr. Viebrock and Ms. Montross displayed a draft site plan for a 10-lot subdivision on Mountain Farm and Camp Comfort Roads. The Board declared itself SEQRA lead agency and discussed various aspects of the development including: wetlands, EAF, scoping document, local roads, DEI’S, run off detention methods, sewer moratorium, sub-surface disposal, existing drainage system, plus water and sewer adequacy. Four neighbors also were present to better understand the proposal. Chair Hanson requested a revised EAF be submitted for review by the Board’s planning consultant Bonnie Franson. 4) An arrorney/client closed-session was held, and the meeting was adjourned at about 10 pm. The Village Planning Board met at 7:30 PM Mon day June 1, 2009 and heard a Lot Line Change application from Mr. Alderisio and his attorney Ms. Rich. The matter involves transferring a sliver of property along Patterson Brook belonging to Walter Deane to "Glocomora" neighbor Joe Alderisio. After review, it was determined by Attorney Golden that granting the application would decrease conformance of the Deane parcel and consequently the subject property transfer will require a formal subdivision rather than a lot line shift. The applicants Alderisio and Deanne will be provided an agenda slot on June 15 for presentation, Public Hearing and possibly SEQRA environmental assessment. Minutes of 2 prior 1009 meetings were discussed, amended and accepted. A 1-hour educational lecture commenced with Richard Golden explaining the recent concept of "Smart Code" zoning vs. more conventional Planning Board and Board of Zoning Appeals consideration of land use. Smart Codes attempt to go beyond regulating "use" and reach into planning, architecture, landscaping, road layout and other design elements for a "package" form of property governance. The meeting closed at approximately 10 PM. Village Planning Board to Hold Education Session on "Smart Code"
Residents are encouraged to attend and educate themselves. The Village Planning Board met at 7:30 on Monday May 18th with four members present plus the Village Engineer, Building Inspector, Clerk and Planning Board Attorney. Mr Witte represented himself with regard to tree screening of his proposed new home on Tower Hill Loop. He presented a seemingly accurate assessment of those trees requiring removal, those significant trees to remain and those still questionable. However, it was revealed that the screening inventory had not taken into account potential significant tree loss from digging up the property to install the proposed drainage collection system, underground detention vessels, discharge plumbing and gravel spreader areas. Mr. Witte presented the Board with his formal vegetation analysis nevertheless and the PB agreed to study its content. is contemplated. Mr. Sendowski agreed to evaluate this suggestion as well. Current neighbor, Paola Tocci expressed concern with the Sendowski's proposed forced sewer main to be located in Lookout Stable Rd. She was mindful of her own septic connection which runs across that street, perpendicular to the anticipated forced main. Drainage considerations were also discussed including the local stream bed, impending construction on Lookout Mtn Rd above, cul de sac condition, wet-lands and current erosion patterns on an adjacent parcel. Minutes of prior PB meetings were considered, amended and approved. Another draft of the proposed fence legislation was deliberated upon by the Board, with general acceptance of the basic format and topics addressed. The meeting adjourned at about 10 PM. The Village Planning Board met on Monday May 4, 2009 at 7:30pm with all members in attendance. The Board’s first agenda item was consideration of the 3-lot Ribondo Subdivision near Nursery Road in the Town, but possibly visible from the Village. SEQRA requires National Register properties be given an opportunity to comment. Chair Hanson suggested engaging a photo-simulation firm to determine visibility and John Ledwith was asked to alert the closest VTP neighbor, Tuxedo Park Estates. The second agenda matter was Mrs. Sendowski’s application for a new home on Lookout Stable Road. This latest iteration shows an extended house footprint, shingle-style architecture and 5 terraced retaining walls. Issues of “disturbance area”, sewer-connection, topography, wetlands and cut/fill were discussed with the project’s architect and engineer. The Planning Board then entered into an executive session with attorney Rick Golden. Following this Executive Session, one set of minutes was approved and the Board proceeded to consider new fence and wall legislation. Comments concerning the draft Fence Ordinance had been received from Charlotte Worthy and Jim Hayes with more expected. Many differing approaches, opinions and suggestions were considered, but clear-cut verbiage was not yet agreed upon. Work will continue on this sector of Code revision. The Meeting adjourned at approximately 10:30 PM. With all members present, the Village Planning Board met at 7:30 on Monday April 6, 2009 to consider the Witte and Umansky applications for new homes. 1.) Mr. Witte appeared with his engineer Mark Lecasing for further discussions of utilities, storm water management, rock removal and pipe lining at his Tower Hill Loop site. Mr. Ledwith B.I. and Mr. Golden V.A. raised questions of a multiple sewer connection, manhole addition, end-of-main sedimentation and easement. Engineer Massy indicated a PE certification should be required of the finished water, sewer and drainage systems before a c. of o. issues. The project’s Landscape Architect was not present, but tree trimming, removal, replacements, view shed and BZA tree restrictions were considered on the existing site plan. 2.) Mr. Umansky of Vanum Properties LLC appeared with his engineer Steve Deutsch and architect Jim Collins with regard to a proposed home at “Maxwell’s Corner” on Tuxedo Road (Alexander Garden). Important matters included driveway access, home location, set-backs, height of structure, existing drain-piping, storm water control, easements, and design compatibility. A 2000 letter from Earle Stevens was read at his request revering the original garden and extolling the lost Alexander foundation and suggesting the site is our Village’s focal point deserving of conservation. 3.) The Board then addressed its attempt to re-draft a portion of Village Code dealing with fences and retaining walls as requested by the Mayor and Trustees. Please be advised that the Planning Board has scheduled a special meeting on April 7, 2009 at 7:30 p.m. to discuss the Witte building permit application for a new home on Tower Hill Loop. The Village Planning Board met on Monday, March 16 at 7:30pm. Mr. Witte and his engineer, Mark Lukasik, explained the erosion and runoff-control system proposed for this property on Tower Hill Loop. It involves rain water collection, underground detention chambers, 4 discharge “spill-overs”, 4 gravel spreader areas, and re-vegetation. The Board questioned potential site disturbance at the Witte property, maintenance requirements of the system and retaining wall integrity. Building Inspector Ledwith and Village Engineer Messer discussed with the applicant: water and sewer hook-ups, easements across the Salm property for utility connection, underground electric service and the anticipated problem of breaking through ledge rock. Some Board members felt it preferable to run these utility pipes to the road rather than across neighboring property. A discussion of revamping and/or reviewing the existing Code pertaining to “Fences” ensued. Discrepancies in the Ordinance seem to require attention and the Planning Board has been asked to review this legislation. An attorney/client Executive Session was held and the Meeting adjourned at approximately 10:15 PM. Please be advisted that the February 2, 2009 Planning Board meeting has been cancelled due to the lack of any agenda items. The Village Planning Board met on Monday December 15 at 7:30 pm. Four members were present together with Attorney Golden, Engineer Messer, Building Inspector Ledwith and Clerk Grimmig. Mr. & Mrs. Witte, with their engineer and landscape architect, presented the elements of their new house plan for Tower Hill Loop. Concerns about the proposed water service from Mr. Salm’s greenhouse were raised, as well as the issues of sewer adequacy, manhole rebuilding and utility easements. Erosion control and storm water management were deemed necessary at a 25-year storm level. A few seeming discrepancies in the applicant’s siting replication caused the Board to recommend a professional photo-simulation of house and parcel be submitted. The applicants will endeavor to meet the Village Engineer’s requirements. Architect Collins, together with Karen Hart and Jill Downing, represented the Siegels in their application for a new home on Lookout Stable Road. The site is less than 1 acre and topographically challenging. BZA variances had been granted, but several neighbors were present pointing up the adversities of runoff, sewer, water supply, ledge rock and site disturbance. Grading, landscaping and a retaining wall are proposed to help create a more level building platform for the approximately 5000 sq. ft. home. Minutes were approved and the P.B. meeting adjourned at 10 PM. The Village Planning Board met on Monday, September 29 at 7:30pm to consider the Heibel application in terms of advising the BZA during that Board's consideration of a variance from the Village's Ridge Line building restriction. The Heibel lot on Camp Comfort Rd. lies between Cassis and Sugden and affords one home site location, which complies with Village Zoning and would not require a variance. However, construction at that sector of the property would deny any view of the Lake or Eastern landscape. The applicant, together with his architect and attorney helped explain the draft plan which had been previously introduced on September 8 locating the home in a "ridge" area and thus necessitating a BZA variance. Several neighboring families were in attendance including Cassis, Humphrey and Boyle who were seeking information and generally expressing opposition to the draft plan. Most Planning Board members had visited the site on September 27 to inspect Mr. Heibel's delineated house footprint and to consider the ramifications of his proposed site disturbance, garden excavation, retaining walls, pool, potential tree removal and driveway access. Chair Hanson and Board Attorney Golden concluded the Planning Board's discussion by offering to compose a letter to the BZA expressing the Board's aggregate opinion of the Heibel draft plan for home siting. So as to expedite the applicant's BZA hearing, the Board agreed to issue its letter within one week. The balance of the meeting was spent in a privileged attorney-client session, and in approving several sets of outstanding minutes. The Village Planning Board met at 7:30 PM on Monday, September 8 in response to the Zoning Board's request for input relating to the Heibel's BZA appeal for relief from Code Section 100-13 Ridge Line, at their Camp Comfort Rd. site. Mr. Heibel's attorney opened with a challenge of the Ridge Line determination. Mr.Toby Guggenheimer, architect for the Heibels, had submitted an alternative draft site plan showing the new house footprint within the Building Inspector's designated ridge area. The Planning Board seemed to agree that Mr. Guggenheimer's proposed location presented less of a viewshed intrusion than some of his prior submissions. Neighbors Humphrey and Cassis were present with concerns about the project, and resident Alan Stenberg spoke later in support of the applicant. Board members questioned the proposed new home's visibility from the Cassis property as well as from Tuxedo Lake and from homes on the Eastern Lake side. Issues of house size and design, retaining walls, roof height, site disturbance, garden, pool, driveway, drainage patterns, tree preservation, utilities, blasting and run-off detention were all discussed, as well as the driveway leading to a basement level rather than to living space. The Planning Board had previously identified a site within this lot, which might support a new home, but without need of a variance. However, views, yard space and sun exposure were considered superior at the higher elevation siting. After an attorney-client privileged executive session, the Board resumed discussion with the applicant for a short while and then considered prior meeting minutes. The meeting adjourned at about 9:30. Copy of sewer inspection tape. Any engineering data which supports your belief that existing water and sewer lines on the Salm property are suitable for the additional demands associated with your project. Copies of the easements you believe permit the use of those water and sewer lines for your project. Landscape plan showing particular trees which you intend to remove. Site plan showing a) both existing and proposed topography; b) fuel tank placement; c) any area to be blasted; d) proposed stormwater tanks; e) proposed utility lines; and f) proposed limits of site disturbance. Form of Non-disturbance Agreement (in recordable form) which you propose for the maintenance of the remaining number of all other trees on the site. Square footage of a) house; b) garage; and c) terrace. Previous photos of Price house. Thank you for your kind courtesies. The Village Planning Board met on June 30, 2008. All 5 members were present together with Building Inspector John Ledwith. The entire session was consumed with completing, correcting and approving 8 sets of minutes from the more complex meetings of the recent past. Susan Boyle will be retiring from the Planning Board, and those interested in a seat on this Board are encouraged to contact the Village Office with their credentials, resume or CV. The meeting closed at approximately 9 PM. The Village Planning Board met on May 19, 2008. The meeting opened at 7:40 PM with one member absent, but including Bonnie Franson, Planner; Atty. Rick Golden and George Janes of Environmental Simulation Center. Chair JoAnn Hanson had invited Mr. Janes to enlightened the Planning Board as to available “static” and “dynamic” simulations of proposed development projects. His Power Point presentation demonstrated the value of these “preview” graphics to the aesthetic evaluation of construction proposals from single homes to commercial centers. “Real-Time” simulations allow the viewer to “virtually” walk the streets of a CAD replicated development. Aerial views, night views, seasonal views and comparative views are all feasible with the appropriate designer/programmer and software package, long before the first brick is laid. The P.B. then, with the assistance of Planner Franson and Attorney Golden, reviewed the draft Gateway Overlay zoning amendment [Local Law #2 2008]. In assisting the Board of Trustees, the P.B. proceeded to read EAF Part 1 followed by their impact determinations within Part 2. Although Lead Agency authority resides with the B.O.T., the P.B. vote resulted in a 4:0 decision for a negative (benign) declaration of environmental impact. Next, the P.B., assisted by Atty. Golden and Planner Franson, considered a revised draft “Lake Law” [Local Law #4 2008]. This legislation proved more difficult to analyze as certain health and safety information was unavailable. Using the “best judgement” approach, P.B. members reviewed EAF Part 1 and proceeded to evaluate the potential impact questions of Part 2. Again, recognizing the B.O.T. as Lead Agency, the P.B. performed an assistive function concluding with a vote of 3:0:1 in favor of a negative declaration for the proposed law to safeguard our 3 lakes. Minutes of the P.B.’s 5/5/08 meeting were then read, amended and approved. A motion to adjourn was made and accepted at about 10:30 PM. Discussion and report to Board of Trustees on SEQRA input for proposed Gateway Viewshed Local Law #2. The P.B. convened at 7:30 PM 5/5/08 with one member absent. Mr. Heibel was represented by Tobias Guggenheimer, Architect regarding a 7 acre site on Camp Comfort Road. Neighbors, John and Sarah Cassis, were present as Mr. Guggenheimer displayed 5 alternative site plans for a home and appurtenances on the Heibel parcel. A letter listing several concerns had, that day, been submitted by another neighbor, Samuel Sugden. The P.B. Chair reminded Mr. Guggenheimer several times of a house location on the lot which would not require a variance. However, each of 5 option plans presented depicted construction at the “ridge” of the property which would require a BZA variance. Mr. Guggenheimer reminded the P.B. that he had discussed this case with the BZA, which Board had then requested the P.B. review each suggested alternate house, pool and garden arrangement. As Architect, Mr. Guggenheimer reiterated the dark, damp and vista-less condition at the one identified “conforming” location. He further explained his efforts to locate the proposed structures as low and as remote from the neighbor’s homes as practicable. After site plan explanations, questions and general discussions, the P.B. agreed to a more in-depth review pending release of intended topography, driveway geometry and site “staking”. An executive session ensued with the public meeting resuming thereafter. Attorney Golden’s letter to T.P.E., concerning deficiencies in their subdivision DEIS, was reviewed and some suggestions were sent back to his office. Minutes for 2 prior 2008 meetings were read, amended and approved. At 10:45 the P.B. meeting was adjourned. The Village Planning Board met on April 21, 2008. The Meeting opened at 7:30 PM with all 5 Board members, Attorney Golden and Engineer Messer in attendance. The evening’s objective was to vote on whether the Tuxedo Park Estate’s Draft Environmental Impact Statement (DEIS) is “complete” and ready for formal analysis. This 100 page document references another 50 pages of data, plus numerous maps, site plans, and engineering calculations. The underlying project is a 5-lot subdivision of 23 acres on Tuxedo Road. This property has been considered quite steep and very visible, so an Environmental Impact Statement had been required. Houston Stebbins, Mayor; Bonnie Franson, VTP Planner; and two associate attorneys of Rick Golden’s office were present together with Building Inspector John Ledwith. For TPE were John O’rourke, Engr. ; Counselors Richard Burns, Joel Sacks and Tom Seifert, plus Ms. Evren Ulker-Kacar. Engineer Messer stated the applicant’s storm water calculations dated to 1996 and were so unclear as to be not useful in his determination. He was also concerned with truck traffic, storm water volumes and erosion during the construction phase as these issues were not covered adequately. Bonnie Franson advised of undocumented hazards in blasting close to an existing road and water main. She noted that the Cultural Resources Study dated back to 1994 and made no reference to the Quartz Quarry found nearby. Lot 4’s photo-simulation was deficient and she shared concerns about the driveway analysis as well. Mr. Golden and the P.B. did not accept “cluster housing” as a viable alternate as this proposal violates the Zoning Code of Tuxedo Park. Board members voiced opinions suggesting that several important topics were not addressed adequately in the DEIS. These included surface drainage, revegetation in thin soil, diseased hemlock trees, lack of coordination if sites are not developed in tandem, erroneous assumptions as to house site areas and driveway requirements plus inadequate responses regarding: endangered species, 2000+ truck trips, shrub re-growth, bonding of on/off site improvements, appropriateness of connecting to the Town treatment plant and lack of support for the stated 3.9 acre claimed disturbance limit. After discussion with TPE and with a vote of 5 to 0, the E.I.S. was pronounced “not complete” under SEQRA review requirements. Tuxedo Park Estates  Determination of whether the DEIS is sufficient to release to the public and other governmental agencies for comment. The P.B. met at 7:30 PM on Tuesday April 8 to discuss draft legislation entitled “Gateway Overlay District”. This potential addition to our Code represents the combined efforts of our Village attorney, Viewshed Committee and Planning Consultant, Ms. Bonnie Franson. The Planning Board, with input from its counsel, carefully scrutinized each section of this 12-page document. All four Planning Board members present expressed support for protecting both the East and South Gate entry corridors from environmentally intrusive development. Several alterations to the text were suggested for the purposes of clarification, legal effectiveness and fairness to property owners. Chair Hanson called for an executive session with attorney Golden, and the public meeting later resumed with approval of prior meetings’ minutes. Adjournment came at approximately 10:30 PM.